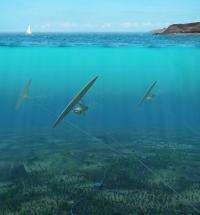 (PhysOrg.com) -- An underwater tidal turbine called an “underwater kite” has just secured finance from investors to ensure its 2011 tests can go ahead. The turbine, known as “Deep Green” was developed by a privately-owned Swedish/UK company, Minesto, and is intended to be tethered 100 meters above the sea bottom. It has a wingspan of 12 meters and a turbine one meter in diameter. The “kite” comprises a wing with a rudder to steer the turbine to face in the direction that will allow it to capture the maximum amount of tidal energy, and generate up to 500 kW of electricity. The kite flies in a figure eight and travels 10 times faster than the water it is tethered in. Ted Rosendahl, chief technical officer with Minesto, said the design will enable Deep Green to operate efficiently at greater depths and with lower current velocities than other tidal energy generators, which opens up new areas of the sea for tidal power generation, increasing the market potential by 80 percent, according to Minesto. Deep Green’s unique ability to work in deep water where there is low velocity water movement means it can operate cost effectively in areas otherwise unavailable for power generation. There are two major types of tidal energy generator installations at present: one is the tidal barrage, which works in a similar way to a hydroelectric power station, and the other uses the flow of the tide and works in a similar way to wind power installations. In comparison with other tidal systems Deep Green is lightweight and much smaller, which translates to lower manufacturing costs. The company will receive two million Euros (around 2.5 m USD) in investment funding, which will enable it to test a 1:4 scale prototype off the coast of Northern Ireland in 2011. The test site, at Strangford Lough, County Down is the location of a tidal generator owned by the UK company SeaGen. If the Deep Green trials are successful, the next step will be to test a full-scale demonstration plant consisting of up to 10 kites. Financing needed for this stage is expected to be around 40 million Euros. Minesto was formed in 2007 for the purpose of developing tidal power generators. Deep Green began as a Saab Group project in 2003, and Minesto was formed as a spin-off company. Don't forget to add in the cost of transporting the energy, mining and smelting the ore for the cables, transporting the tech to the various locations it has to be built and installed, energy consumed in RnD process, etc... I'm not sure this product will end up being energy positive. Still, it's better than some options that are completely energy negative. I wonder how many tons of coal the toy trains powered by the tidal kites can transport. I can't help but suggest all these Lilliputian efforts uninspiring. Apparently, an overdose of politically correct pills triggered all kind of nonsense, including reincarnation of middle age technology (wind mills, kites). Contrast it with Thermonuclear: in this enterprise mankind aspires to a the level of stars! Solar, tidal, and wind power are considered Type 1 technologies. By the way, wind sails are INCREDIBLY efficient in terms of energy and materials in vs energy out. It may not be as FAST as burning fossil fuels or fission power plants ona ship, but it gets the job done with no cons. The problem will be whales, these things may kill them. Much like what windmills do to hawks. They're hauling asymptotes. Their "flight" path could be a killing zone. It may just be a big Waring Blender, and larger preditors, sharks, and whales would be toast. Surface ships collide with whales occasionally, no reason to think this won't. They make make enough noise to keep them away. Energy is never free or without some environmental impact. I am concerned with this idea. It is great to be able to harvest the energy of the tide. It provides an excellent alternative to other renewable energy if there is a cloudy/windless day and at night. But does it produce enough electricity and at that depth, is it easy to service a broken one?